If you have heard of phrasal verbs then definitely know how confusing the can be, especially when they are being used in a figurative sense. 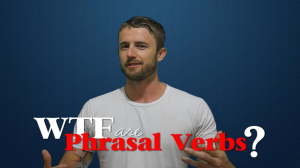 In this video lesson you are going to learn the difference between literal and figurative phrasal verbs, plus common examples of some phrasal verbs you will hear a lot in real life situations. Ok guys, so, phrasal verbs are quite a difficult subject in English but let me quickly explain to you what they are. So, we have two types of phrasal verbs. We have a literal phrasal verb, and a figurative phrasal verb. Today I’m just going to focus on the figurative, but let me just give you a quick explanation of what they are. A phrasal verb will always be a verb and a preposition, ok? When these two words are together, it often takes on a different meaning. So, let me give you a good example that will also show you the difference between a literal and a figurative phrasal verb. “To run out of something.” This means that it has finished. I have consumed all of this. So, this is a good example of the same phrasal verb being used in a literal sense and a figurative sense. Ok, so now that you know the difference between a literal and a figurative phrasal verb, let me just help you out here really quickly and give you four phrasal verbs that you will hear very often. The first one is “to give up.” “Give up.” When you think about that, the verb to give, to give up, it’s not used in a literal sense. So, the verb “to give up” means to stop doing something, sometimes because it’s really difficult. “To give up” is the first phrasal verb you’re going to hear and see a lot. Second phrasal verbs you guys are going to hear a lot in English is the phrasal verb “to find out.” So, “find out” would be a synonym of, maybe, the verb to discover, but we use “find out” a lot more in just, uh, you know, less academic situations. That means that right now I’m anticipating my trip and I feel really excited about it. What are you looking forward to? Ok, so, the last phrasal verbs that you guys have to know is actually, I’m going to give you two phrasal verbs. This is a 2 for 1 special. I’m going to teach you guys the phrasal verbs “to pick up” and “to drop off.” Ok? The reason I’m teaching both of these is because they’re very relevant. “To pick someone up” or “to drop someone off” means that you’re going to go somewhere and collect someone. It doesn’t have to always be a person, it can be an object as well, like, if I left my keys at Justin’s house, I would go there and pick them up. “To pick my keys up” or “to pick up my keys.” It can be separable or inseparable. “To drop off” would be to actually deliver something to someone, ok? And, like I said, we can use this to people, like, “I’m going to drop my friend off at the party” or “I’m going to pick my friend up at the party.” Ok? Ok guys, that’s my very quick video to teach you guys how to use figurative phrasal verbs in English and keep listening, because you’re going to hear these a lot. This is something that’s very common in English, we use this all the time. Now, stay tuned because my next video is going to be about how to use literal phrasal verbs. Sound easy, but there’s a few little tricks there that you guys should really know about, so… If you haven’t signed up yet, make sure you subscribe to our YouTube channel, where you’ll always receive our newest videos. Plus, you can also go to our website, there is a link in the box below where you can get the full transcript for this video and hear everything and read everything that I’m saying. Ok guys, thanks a lot for watching, hope you guys really enjoyed this video, and I’ll see you next time on RealLife TV. Thank you, Chad. Phrasal verbs is really difficulte to memorize. I liked this video. Hello Hermann, thanks a lot for your feedback on my video lesson. Let me just clarify some things because it seems you haven't watched (or understood) this presentation. The purpose of this video lesson is to teach people the concept of phrasal verbs so they are more prepared when they come up (phrasal verb meaning appear, you probably know that) in conversation or in a written text. I realize I could technically explain phrasal verbs in more detail with all the grammatical elements that go with it, but I wouldn't want to confuse people who are watching as this information is useless for the application of phrasal verbs. Anyway, thanks for your concern and I'm really looking forward (this one I explained in the lesson) to seeing your video mate. Very clear! Thanks! I'll share it. Great video. As simple as that. The simpler, the better. I love the work you guys do in teaching English. It was an amazing answer! I do believe your aim was achieved. The video was clear and objective! No need to go through specific details, you are teaching English for communicaton not English for academic porpouse, it needs to be simple! Thanks Chad and all the guys of Real life! Your videos are excellent ..a way for my son (teenager) to learn english…he really likes them and most of all , understand them ! Great job!! Chad Fishwick Hello, thank you for your response. However, I´m afraid I'll have to disagree once more. I pointed out there was an error in your first explanation. In your answer you seem to be using an Occam's razor-like argument, "The explanation requiring the fewest assumptions is most likely to be correct." I'm sorry to say that it still is not correct, though. It may sound simple but there IS an error leading (mis-leading) students to conclude that phrasal verbs are always made up by a preposition. Best regards. Thank you for the useful lesson, we should use these phrasable verbs in daily life to get used to them and coild by the way memorize them.